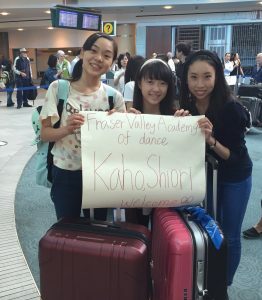 The Fraser Valley Academy of Dance is expanding their reach beyond the lower mainland, across the ocean and into Japan, as Japanese students arrive in Mission. After eight years focussed on developing the school into a dedicated centre of traditional classical training and performing arts, Artistic Director John C. Carney believes the Academy is well prepared for this new partnership. This month saw the arrival of their newest teacher, Miss Seira Shimamura, who moved from Osaka, Japan, to Mission to work at the Academy. Having completed an intensive three years of full-time training in the Royal Winnipeg Ballet School Teacher’s Training program, following a 4-year Performing Arts Degree in Osaka, Miss Seira is yet another exceptional addition to the current Academy staff. A few days later, Mr. Masami Kobayashi of The Admissions Co, a Japanese study-abroad and cultural exchange placement organization, travelled to Mission to view the Academy to determine its eligibility for student placement with his company. He maintains a very selective list of ballet schools in Canada into which he has placed Japanese students for well over a decade, including Canada’s National Ballet School and the Royal Winnipeg Ballet School. 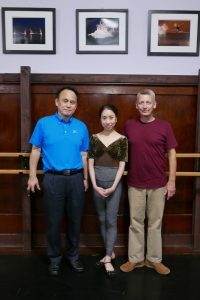 At the end of that week, two Japanese ballet students, Kaho and Shiori, flew in from Tokyo to train with Mr. Carney and his teachers for the Academy’s final week of Summer 2016 ballet intensive. Both students were placed at the Academy by The Admissions Co. The Academy is extremely honoured to be part of this new extended Japanese family, and Mr. Carney looks forward to welcoming many more students into Mission. For more information on the Academy and its programs, please contact Mrs. Carney at 604-826-0097 orinfo@fvad.ca, or visit the website at www.fvad.ca.